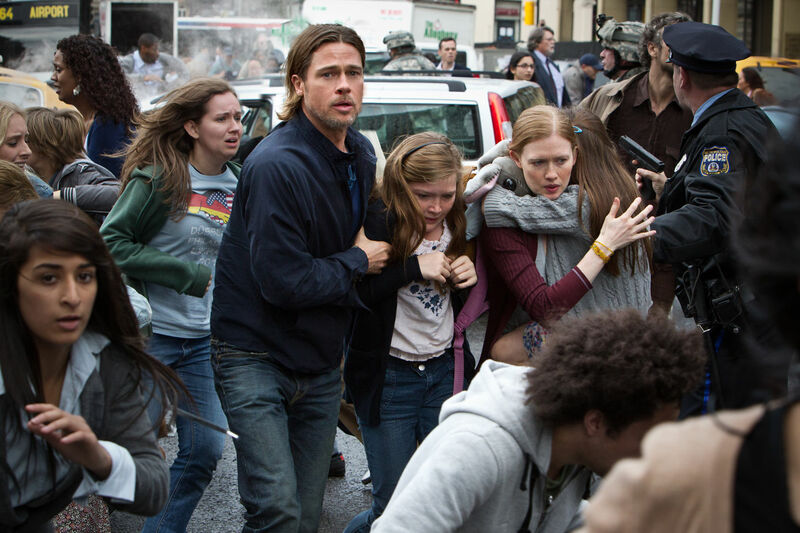 There’s really only one truly great and memorable sequence in “World War Z,” the latest zombie related entertainment the industry has thrown at us. The scene takes aboard an airplane flight. Everything seems to be going well until an infected person (zombie) makes its way up from the cargo hold. Then all hell breaks loose. So where do you go exactly to get away from a zombie when you’re aboard an airplane? It’s a scary thought; perhaps the whole movie should have taken place on the plane. It worked for snakes, why not infected, raging humans? I looked forward to “World War Z,” not as a fan of the book (which I haven’t read), nor as a huge zombie fan (though I am), but more as a huge fan of disaster flicks. A movie that looks like “War of the Worlds” meets “28 Days Later?” I’m so there. The problem is, the movie just sort of quickly moves along without giving us anything truly memorable or giving us anyone to really care all that much about. Brad Pitt gives a good performance in “World War Z” and it was truly fun to be able to watch someone of his caliber sort of slumming it in a zombie related summer action flick. Check out his filmography. While he does do fun movies (Ocean’s Eleven), action movies (Mr. and Mrs. Smith) and silly movies (Burn After Reading) you’d be hard pressed to find just a flat out awesome summer action thriller on his resume. This film could have been it, but alas it just disappoints. The film begins like “War of the Worlds” in that it follows the plight of a family trying to survive the immediate onslaught of a terrible disaster; humans have been come infected with a rage virus which is spreading like wildfire. There are explosions and lots of people are killed and it’s pure chaos. But quickly (way too quickly) the family is saved by Gerry Lane’s (Pitt) colleagues from the United Nations where he used to be employed. His wife and two young daughters are whisked away to a US navy ship, where the family is no longer in jeopardy for the entire rest of the film. And Gerry goes off to various exotic locations like South Korea and Jerusalem in order to figure out how this outbreak occurred and how to stop it. The problem is that none of the sequences Gerry’s involved in (save for that airplane scene I mentioned) aren’t nearly as exciting nor as frightening as they should be. The film sets up such a scary situation (though rather too quickly if you ask me) and then really doesn’t do much with it. The book, as I’ve heard, doesn’t follow a straight narrative and is rather a collection of various accounts about how this zombie war began, started, and ended. And even though the film follows one main character, we never really get to spend that much time knowing him or really caring all that much if he gets back to his family. We know they’re safe and we know since Gerry is the lead that everyone will most likely live happily ever after. I’m not quite sure what the problem here is. Could it be that direct Marc Forster, who is a competent enough director though nothing special, has tried his hand at way too many different types of genres? He bounces from drama (Monster’s Ball) to comedy (Stranger Than Fiction) to action (Quantum of Solace) without any of them sharing any similar vision. I would have preferred to see James Cameron or Steven Spielberg or Ridley Scott or Christopher Nolan or even Frank Darabont’s interpretation of “World War Z.” Forster’s film just looks and feels bland; there’s nothing very visually interesting going on. And at this point it's just cliché to blame co-screenwriter Damon Lindelof, so I won't even blame him.